Bedsores Can Be Caused by Nursing Home Negligence | Hupy and Abraham, S.C. Right now it might be difficult to even know what to ask. Your loved one is suffering from a bedsore. She is in pain and her life may be in danger. It is up to you to figure out what needs to be done to keep her safe and to protect your rights, and that can be overwhelming. As your loved one begins the healing process, you may have questions. How Does a Bedsore Develop? According to the Mayo Clinic, bedsores can develop when pressure is put on a specific area of skin for too long. Bedsores, or pressure ulcers, are more common in people who cannot reposition themselves and who are confined to beds or wheelchairs. They are also more common in people who are not getting adequate nutrition and those who may have trouble keeping themselves dry and clean. What Are Some Symptoms of Bedsores? Skin that is red, otherwise discolored, itchy, spongy, or firm. These could be symptoms of a Stage 1 bedsore. An open wound. This could be a sign of a Stage II bedsore. A deep wound that goes below the surface skin. This could be a sign of a Stage III bedsore. Lost a lot of skin and may have damage to the bone, muscle, joints, or tendons below the wound. This could be a sign of a Stage IV bedsore. Signs of serious and potentially life-threatening infections may also be present. The resident is kept clean and dry. The resident is regularly repositioned in her bed or wheelchair. The resident had adequate nutrition. Nursing home staff checks the resident for bedsores often, so that any bedsores can be treated promptly. 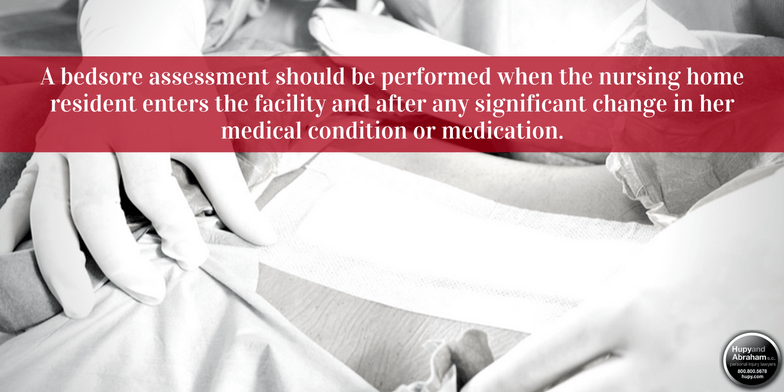 A bedsore assessment should be performed when the nursing home resident enters the facility and after any significant change in her medical condition or medication. The recommendations of the bedsore assessment are to be followed by nursing home staff. It is easier to prevent a bedsore than it is to treat one. However, nursing home staff members have a responsibility not only to prevent bedsores, but also to identify bedsores and to get patients prompt treatment for them if they develop. Did the Bedsore Occur Because Someone Was Negligent? Possibly. If nursing home staff failed to provide your loved one with reasonable care and the bedsore was the result of that failure, then the nursing home may have been negligent. How Can I Prove the Bedsore Developed Because Someone Was Negligent? You will need facts about your loved one’s care. The nursing home may be reluctant to give you this information, but there are ways to ask the questions so that the nursing home is legally obligated to answer you. Your loved one’s nursing home chart, medical records, and information from other nursing home residents and staff may provide you with the information that you need to determine if the bedsore was caused by nursing home staff negligence. What Steps Should I Take Now to Protect My Loved One? Right now, you should make sure that your loved one is getting good medical care, you should figure out where your loved one is going to live if she heals well enough to be discharged from the hospital, and you should find out what your loved one’s legal rights are so that they can be protected. It may feel like the burden of your loved one’s recovery is on your shoulders, but you don’t have to have all of the answers yet. Instead, you can consult with your loved one’s doctors and experienced nursing home abuse lawyers to ask your questions and to develop the plan of action that is right for your loved one who has suffered this type of nursing home injury. Please start a live chat with us today for more information.